Ok, just got out of the 8:30 A.M. showing of “Lawless” … how I got in is another story entirely. But anyways, here’s my account of day 2 in beautiful Cannes (which was two days ago). My afternoon began with a fantastic Lumiere screening of “Rust and Bone” at 3:00 P.M. I had to sit in the very back row in the balcony, but the image and the sound were still impeccable, so it was all fine by me. Hopefully my review will come down the pipes later. I was quickly whisked away to the Olympia Theater, a multiplex used for regular year-round film screenings in Cannes, for a “secret screening” held by the Weinstein Company. I don’t think I am allowed to say what I saw, but I am almost positive I wouldn’t be able to say what I thought. The rest of the screening attendees were buyers and international distributors – AKA no press (or bloggers). So perhaps one of these days, my virtual embargo will be lifted. But until then, my lips are sealed. I can tell you one thing – er, person – I did see though: Harvey Weinstein himself. I almost didn’t recognize him since he was dressed so casually in an untucked white-button down, but as soon as he walked down the staircase where I was waiting, I knew exactly who he was. You could just hear the whispers going around the room: “Oh my god, that’s Harvey Weinstein!” Think the scene in “Elf” where Miles Finch walks down the hallway and everyone is saying his name. Harvey, much like Miles Finch, was totally unphased by taking the air out of the room. And then, after grabbing some delectable tiramisu gelato, I was off to a beach screening of “Dr. No” to celebrate the 50th anniversary of James Bond. I had never seen the movie in its entirety, so it was probably nice education to finally sit down and watch it. (Plus, now the “Austin Powers” movies make even more sense and will probably be even funnier.) 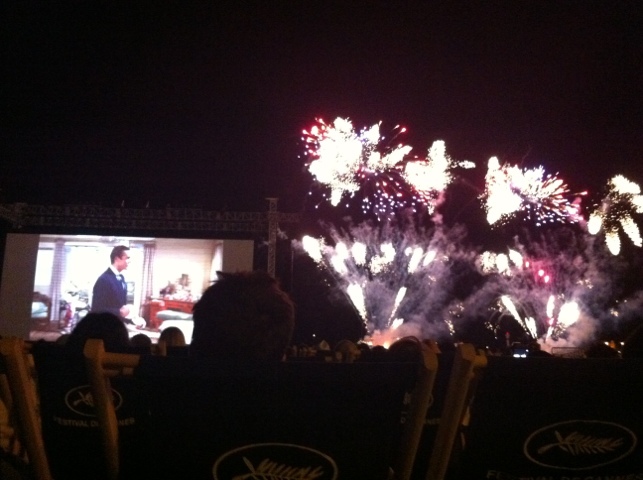 The setting was beautiful, I was happily curled up under a Stella Artois fleece blanket, and then … fireworks. It was truly one of the most amazing pyrotechnic displays I have ever seen, and it just seemed unceasing as well. The perfect ending to an excellent day. Try watching James Bond with that going on. I dare you. McDonalds…and raised in a foodie family. Cannes sounds fantastic! It was less the food than the idea of trying this new technology … turns out it is NOT American-proof. Don’t expect any kiosks at fast food restaurants stateside anytime soon! I’m jealous that you’re at Cannes to cover the festival for us film buffs. BTW, are you going to attend a screening of the newly-restored, extended cut of Sergio Leone’s Once Upon a Time in America? That I really want to see being a big Leone fan. I had to work then. Would have loved to have seen it … had a friend that went and listed off all the stars he saw: DeNiro, Morricone, and so many more.